Take part in the draw to win two tickets for the Copa del Rey final! The Copa del Rey final is ever closer, and we’re giving you the chance to enjoy it in person! From Thursday 22 March through to 5 April, Barça fans will be able to take part in a draw for two tickets to the Wanda Metropolitano in Madrid, to watch the grand finale of the cup competition against Sevilla. It doesn’t matter where you are! 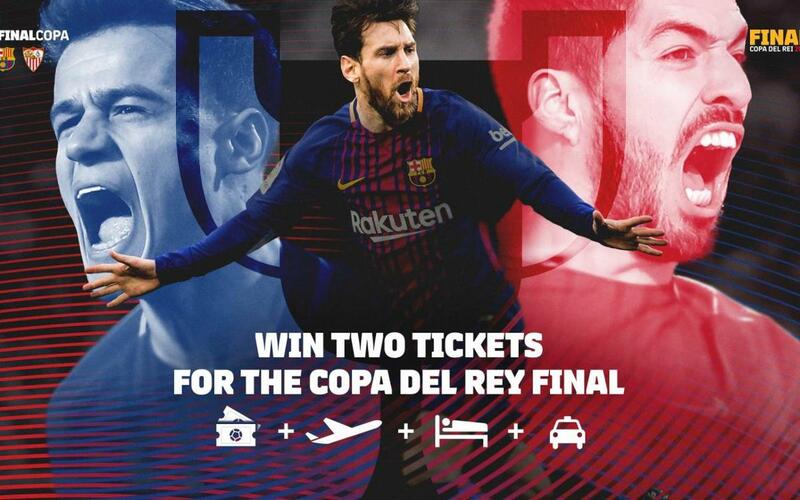 Fans around the world can participate in this draw, with the prize of being in attendance for Barça’s fourth consecutive Copa de Rey final. The club want everyone to have a chance of winning and cheering the team on to victory, whatever their location. Round trip plane ticket to Madrid: From the closest airport to the winner’s city of residence, for both the winner and their guest. Ticket for the winner and their guest to the Copa del Rey final between FC Barcelona and Sevilla CF, at the Wanda Metropolitano stadium in Madrid, on 21 April 2018. Two nights’ accomodation at a hotel in Madrid. Transportation expenses for trips between the airport and hotel/hotel and the stadium.